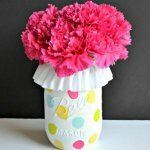 Mason jars have been lately very popular not only as a decorative item but also for the gifting purposes and look appropriate and perfect. 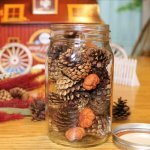 Here we will share 12 Cute DIY Mason Jar Candles Tutorials attention grabbing and eye catching ideas for turning mason jars into candles. 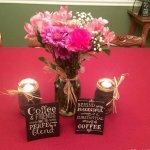 The first project that we have here is based on monogram theme and the DIY mason jars are beautifully decorated and then turned into stunning candles as you can see over here. 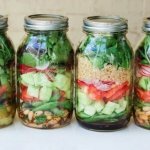 The next project that share with you is basically lantern inspired idea and here the mason jars have been given the gorgeous look of a lantern. This has been done simply by using some crafts like iron wire, lace cloth and jute strings. All these idea that we discuss here are super easy but requires a little extra effort and love for creativity in order to bring a more refined and finished look at the end. 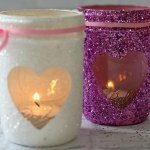 Have a look at this cute project now which is done simply by painting the jars into pink color and then turned into a candle by the usual candle making process that we have already discussed in the tutorials attached in the links given below the pictures. We can also make scented Mason jar candles by adding your favorite fragrances while making the candle and this could be a perfect gift for someone. 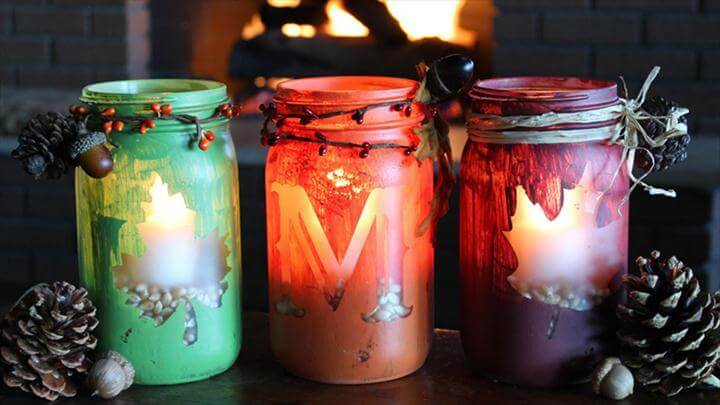 Next we have an autumn themed Mason jar candle here done by painting autumn leaf on to the Mason jar. 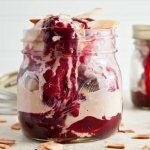 Look at these romantic and mesmerizing heart themed Mason jar candles done with rose red colors and beautiful crafting’s as you can see over here. 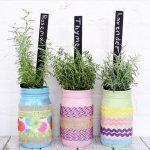 Then we have some other simpler Mason jar projects that can be used not only as candles but also for keeping spices. Next we have floating citronella candles done perfect for gifting someone for the upcoming winters. Find out the procedures of these in the links given below the pictures. 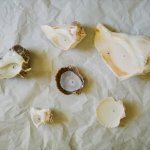 You can also make some snow kissed candle holders to get along with the snow season coming up and can make them, centerpiece for the tables at your home. 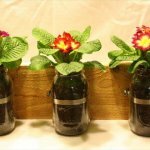 Try these amazing and spellbinding projects and make magnificent diy Mason jar candles.